Just three weeks after earning honors bachelor’s degrees from the University of Delaware, four engineers experienced another milestone. They watched in awe as a device they had worked on for nearly a year shot into space on a sounding rocket from Wallops Island, Virginia. The team constructed the device as part of Senior Design — a capstone course that requires senior electrical and computer engineering students to solve real-world problems and function like small companies. According to NASA, sounding rockets take their name from the nautical term “to sound,” which means to take measurements. Since 1959, NASA-sponsored space and earth science research has used sounding rockets to test instruments used on satellites and spacecraft and to provide information about the sun, stars, galaxies and Earth’s atmosphere and radiation. Since childhood, Aric Lu, who earned a bachelor’s degree in electrical engineering, has been fascinated by outer space. He watched educational programs on TV and attended astronomy summer camp. However, during most of his college years, he focused on other priorities, like class work, undergraduate research in additive manufacturing, and positions as an Honors Program Writing Fellow and Regional Coordinator of the Society of Asian Scientists and Engineers. When the time came for Lu to select a Senior Design project, he learned about an opportunity to build material fit for space flight through NASA’s RockSat-C program for college students. In 2016, advisor Chase Cotton, a professor of electrical and computer engineering, had worked with a team that sent material to space through the program. “I thought, ‘When else are you going to get to fly things up in space this early on?’ ” said Lu. Lu called upon three of his classmates: Beneck, Anton Vasilyev and Ben Steenkamer. All four knew each other from classes and undergraduate research projects. The teammates worked together to design hardware to house a new type of optical integrated circuit made of graphene and silicon. They surrounded the chip with circuits to measure the current flowing through it. The team’s goal was to test foundry processed silicon photonic chiplets with tens of optoelectronic devices integrated on a 2-by-3-millimeter-square area. It aligns with the research efforts of Tingyi Gu, an assistant professor of electrical and computer engineering who has an Early Career Faculty Award from NASA for her research using integrated photonic devices for low power space photonic communication and sensors for space weather observations. The plan is to eventually send those devices to the International Space Station, perhaps in one or two years. The team also built a platform and a navigation system to track the rocket’s acceleration and rotation. The system was constructed to constantly record and save data to an SD card that the team could recover after the launch for analysis. “This innovative collaborative work demonstrates the engineering contributions UD students make each day,” said Kenneth E. Barner, the Charles B. Evans Professor and Chair, Department of Electrical Engineering. To make the system’s mechanical parts, the team utilized the expertise of the Machine Shop in Spencer Lab, which has computer numerical control (CNC) machines. They refined the electrical components in the Evans Hall iSuite, a 4,500-square-foot facility that features a makerspace equipped with 3D printers and other machines to help students conceive, design, prototype and test their ideas and systems. The device was packaged for use in a circuit at UD’s Nanofabrication Facility, which has world-class capabilities in lithography, deposition, etch, thermal processing, characterization and device packaging. The device had bonding pads that measured about 50 micrometers on each side. (That’s about 0.002 inches.) It was a challenge to bond wires to these pads with the help of the staff at UD Nanofab — only one of a handful of attempts worked. These engineers are accustomed to challenging coursework, but this was a whole new level of difficulty. “The breadth and depth of this project were a lot more than any project we’d come across before,” said Steenkamer, who graduated with a degree in computer engineering. Lu learned a lot about project management along the way. “In the spring semester, probably about a quarter of my time awake was devoted to this,” said Lu. There was even a race to the finish line — or launch pad, if you will — at the end. The team spent the week before the flight at NASA’s Wallops Flight Facility preparing the payload for launch. The weekend before the rocket launch, the team nearly suffered a setback. During spin and vibration tests, the experiment almost fully separated from its holding canister, said Vasilyev, who graduated with a bachelor’s degree in electrical engineering. “We tried to make all the possible changes we could to give our payload the greatest probability of surviving the actual launch,” he said. It was a long night of repairs, some of which included glue and masking tape. The efforts paid off. On June 21, before sunrise, the teammates watched the rocket lift off. They watched about a mile from the launchpad, but that was close enough to physically feel the launch, said Lu. “That, coupled with the knowledge that we had something that was on its way to space, gave a certain gravitas to the whole thing,” he said. The rocket soon vanished from sight, leaving only a trail of smoke and steam behind. “You realize just how small the world is, and for a second we were able to, metaphorically, reach out beyond it,” said Lu. But the experience wasn’t all joyful — it was also nerve-wracking. There was still a chance that their device would not survive the launch, leaving all of the team’s hard work lost out there somewhere in the universe. Fortunately, that didn’t happen. The rocket landed in the ocean and was recovered. The team took their device apart and retrieved the SD card, which had recorded more than 1.5 million data points over the course of four hours. For Lu, the project was a primer on the trials and rewards of research. This background will serve him well as he pursues a doctoral degree in electrical engineering at Harvard University, where he will join a research group that uses 3D printing to make soft materials. Beneck is heading to Penn State University for a doctoral degree in electrical engineering. Vasilyev is searching for a job, and Steenkamer will next complete a master’s degree here at UD. Most capstone design projects are relatively low budget ($200), but the rocket effort has launch costs of about $7,000. 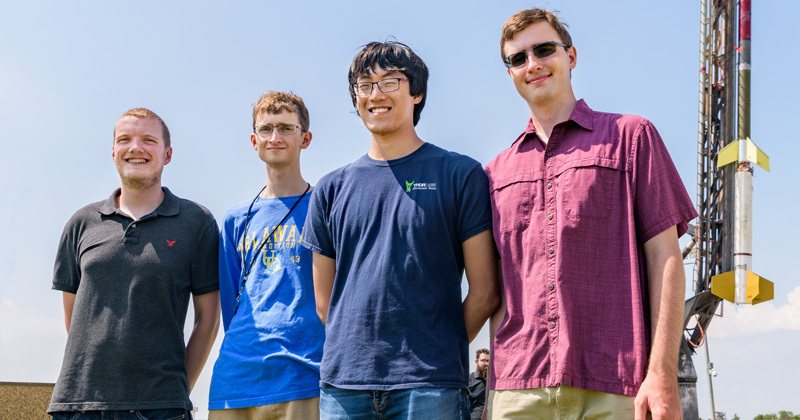 The UD team’s efforts could only have been realized with the generous support of the Delaware Space Grant Consortium, which underwrote the cost of this launch as well as a prior class launch in 2016. Sean Wang, alumnus and Entrepreneur in Residence for the Department of Electrical and Computer Engineering, supported travel expenses for the students through a generous gift to the Senior Design Program.